Quick Mount PV engineered our patented Elevated Water Seal Technology® to make shared rail mounting simple and fast with unparalleled waterproofing. The Shared Rail Composition Mount is designed to work with rail systems in shared-rail and modified shared-rail configurations. Shared rail systems cut down the number of rails, penetrations and components needed so systems are less expensive, lighter, and simpler to design. The use of Quick Mount PV’s Shared Rail Composition Mount assists with alignment of the rows of rail by providing 4.5 inches of north / south adjustability of the L-Foot. 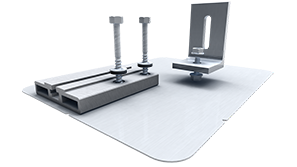 The Shared Rail Composition Mount features a 9 x 12-inch aluminum flashing with alignment guides and rounded corners to easily slide under shingles and speed installation on the roof. WARNING: Quick Mount PV products are NOT designed for and should NOT be used to anchor fall protection equipment. 2x Hex-head lag screw, 5/16" x 4"
2x EPDM bonded sealing washer, 5/16" x 3/4"